Above you see one of the K-27's we produced in 1999. 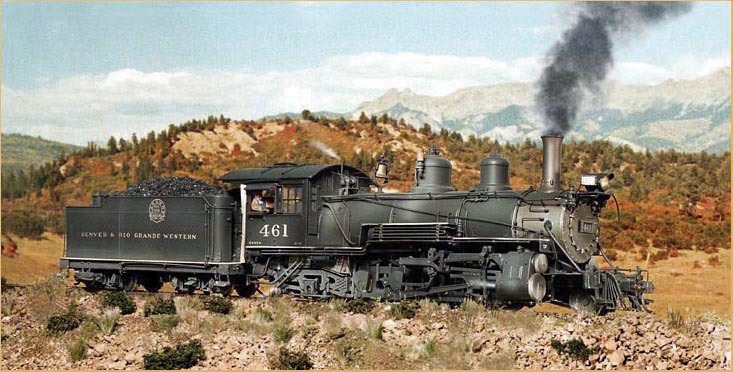 This is the number 461 as she might have appeared around 1939 - 1941. Still in evidence are the "external lubricator lines" on the smokebox. They got rid of these right around 1941 when they began replacing them with the cab mounted "Bullseye" Lubricators. It appears that the idea behind these lines was to warm up the lube oil so it would flow better. But they were undoubtedly a maintanance problem due to their partial placement inside the smokebox with the smoke, soot and cinders traveling through it all the time. Click on any of the Photo Icons below to jump to that section. All Kinds, Shapes & Sizes ! We're hopin' the contents of these pages will make you smile some. And if they do, we'd 'preciate hearin' from ya when you get the time.